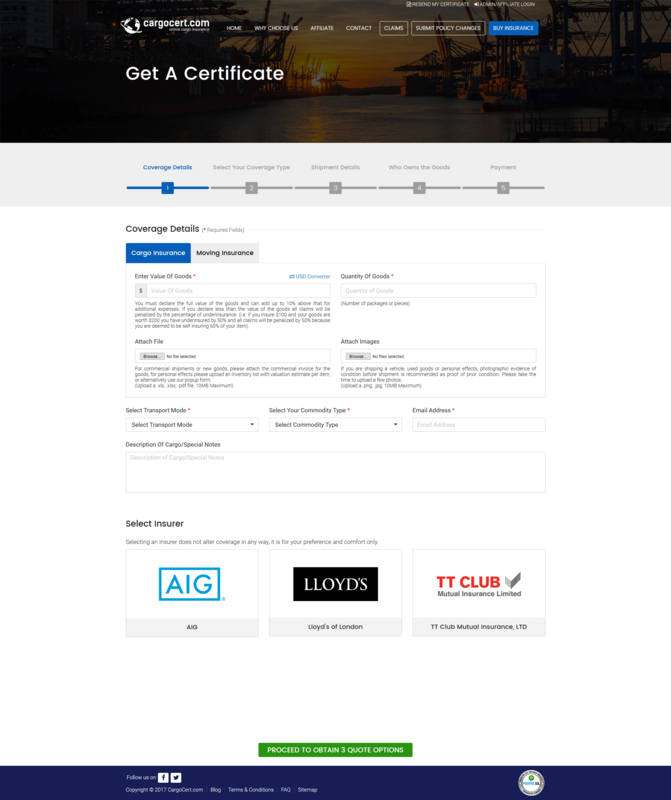 Cargocert.com is an online cargo insurance portal, which provides immediate online cargo insurance backed by world leading insurance companies like Lloyd’s, TT Club, AIG and Navigators. Quality coverage and quality claim service and the pillars of its success. The conduit to these gems is its 24×7 online claim portal – user-friendly, intuitive, and empowering. Allowing one to purchase coverage online instantly, with the certificate of insurance downloaded in minutes. Making it all smooth and easy for insurers with the backing of sound technology. Cargo insurance is a must to get the benefit of adequate compensation in the unfortunate circumstance of damaged or lost goods in transit. 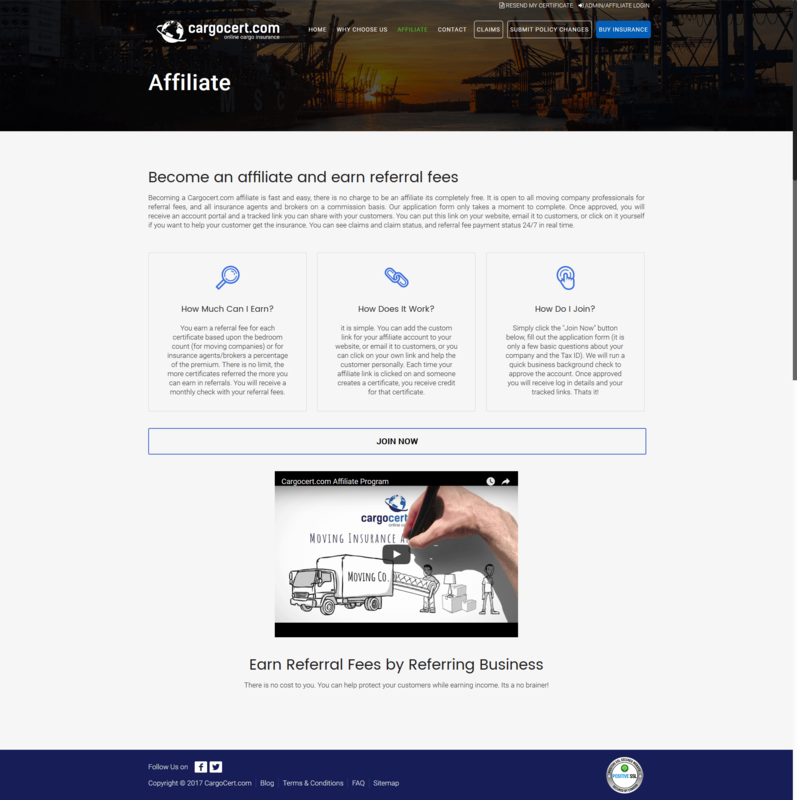 Cargocert.com as a serious player in the insurance industry wanted to build a website from scratch that would enable customers to get instantaneous online cargo insurance. The portal would have to be a responsive website to cater to a traveling and technology savvy segment of customers and potential customers. Those who would insure themselves using smart devices like iPad and smartphones, looking for speed, security, and comfort of use. Additionally, Cargocert.com was looking at managing the content pages on its portal quickly. We built a website for Cargocert.com from scratch, where an insurer can get his cargo insured in a few easy steps. Without any account details or login required. He can get an instant insurance quote for his load and follow it up by taking an insurance policy quickly on credit card payment via BluePay. The system will then generate a secure insurance certificate PDF which the insurer can download. It also sends an email to the insurer with policy and invoice attached. The process is such that the insurer gets a choice of coverage options and can place his trust with any of the top insurance companies on our channel. Quotations are generated using various calculations of an internal rating system which helps him in his decision. Our solution also allows the insurer to request a change in policy if required. In the case of a claim, the system requires minimum information to be provided from the policy before it is settled instantly. We have also provided a quick claim tracking system and a communication system in case the insurer or administration needs to give out some special instruction in the claiming procedure. 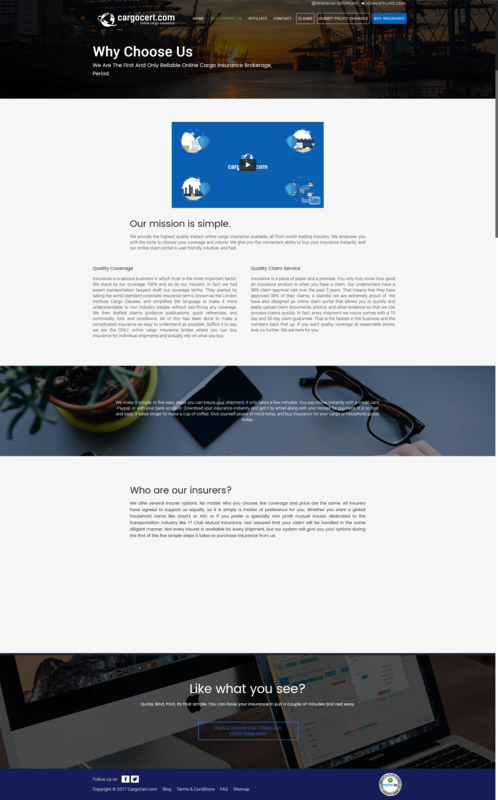 We designed two portals for Cargocert.com. A CMS, where all information is displayed and managed. The other, where actual policy generation and claims are handled. SEO friendly features to improve the online presence of the website. Two different portals for CMS and actual service. This segregation makes the site more efficient and secure.